AfrikaBurn will blow your hair back whichever way you choose to experience it. The more you do, the more fun you’ll have – guaranteed, because it’s a do-ocracy – a place where you’re welcome to start something, make something or do anything (within reason). Forget standing at the sidelines – jump in with both feet and get busy! There are many ways to participate, and it’s largely an anarchic space in the true sense of the word – nobody’s directing the action and you’re free to do as you please as long as it doesn’t hurt anyone else. The only thing expected of you is that you build something, sing something, dance something, cook something, make something, gift something, share something, play something, or fill almost any role that strikes your fancy – so long as you do something you’re participating. If you want to get involved, you’ve come to the right place. For a start there’s a host of volunteer roles that need filling. You can pick your own shifts, and choose what suits you. To get involved in any of these exciting activities, you can email [email protected] or see the list below. If you’re not sure what you want to volunteer for, no problem – you can hop on over to the Volunteer Facebook page, and check out what they’re looking for right now, or get in touch with [email protected] and they’ll help you find your niche. Got any questions about volunteering? Here’s your spot. LOOKING TO JOIN A PROJECT? If you’re looking for a theme camp, artwork or mutant vehicle crew to join, head over to our Community Directory page. It’s where a long list of registered projects is displayed – and many of them indicate that they’re open to new members or collaborators. Click here to browse our Community Directory. See our events listed on Facebook here. Yep, we have an airstrip, and it needs to be staffed by capable aircraft lovers. Sound like the thing for you? Step right this way to sign up for shifts at our Airport. Working here means you’re the reception desk for arriving artists and theme camps, both registered and unregistered. You’d get to help them locate their designated spots (or find them one). This is a great way to meet the people that create the magic of Tankwa Town. Sign up to Volunteer. The large art structures erected at AfrikaBurn need many hands to bring them to life. Good with power tools, wood, metal or electricity? Sign up here to get your tool on! Love all things tickets? Box Office volunteers inspect and scan the ticket of all arriving Burners, and make sure their tickets are good to go, enabling them to get into Tankwa Town as quickly as possible. The Ticketing Team is especially looking for folks that want to do multiple shifts and become part of the core Ticketing Warrior Clan. Click here to get in early. Our DPW are responsible for creating the key infrastructure of the event: roads, signage, toilets and much more. Like getting your hands dirty? Your skills will be put to good use working with the DPW. In order to take on the role of being DPW crew volunteer, you’ll need up to five weeks free time out in the Tankwa Karoo. Blood, sweat and beers over here. When people arrive with Tankwa stars in their eyes, this is the crew that processes them and their tickets. It’s a great way to meet loads of people, and share in the stoke of arrival. Sound good? Click here to get involved. Love the smell of LRP in the morning? Enjoy dressing up as a traffic cop and giving people tickets? You’re just the kind of person who’d love doing time with our Department of Mutant Vehicles! Registration crew head here. Done a shift or two and want to be a shift lead? Over here: this is for you. Bubbly? Enthusiastic? Fancy welcoming the citizens of Tankwa Town with a smile, song or dance? Perfect. Get to dress up and welcome, orientate and inform people as they arrive. Sign up to Greet here. They dish out the coolest – and only – product sold in Tankwa Town. It’s a great way to meet people, and earn the undying admiration of thirsty and hot burners. Cool kids Volunteer here. Every year, behind the scenes, the hard working Kitchen Crew swings into action to keep the AB staff steady on their feet 24/7 by keeping them fed and well hydrated. Even if you’re a kitchen novice, come and help prep, serve, and of course, clean up. You’ll have a unique, behind the scenes, interactions with the folks from all over the world who make AB happen. Get your kicks here. Or here. This one’s for those who love our desert enough to want to stay on, and experience it once the crowds have left – and help to make sure we really do leave no trace. If you’re up for sessions working with DPW to do linesweeps, this one’s for you – click here to get added to the shift lists (and prepare to have an amazing experience). Our Just In(e) boot is where all the missing things are collected. From lost cameras to lost minds, you can find it all here. Shifts involve manning the booth, receiving lost items and logging them and then reuniting people with found items. Sign up to Volunteer! The Tankwa Karoo is a pristine environment, but all the stuff that hits the ground has to be removed, and despite the fact that AfrikaBurn is a Leave No Trace event, some people don’t read – or sometimes forget – the manual. Which is when MOOP happens. (Matter Out Of Place)! Got some karma to work off? Step up and be counted – click here. Fun, while saving the planet from a trashpocalypse? Step right up and join our crew at Blikkiesfontein. Tasks associated with this crew do not include sorting recycling (that’s done by camps who hand in separated waste) – but do include meeting loads of lekker people from many different theme camps and projects. Yes? Click here to sign up and get on board. Be on hand to assist photographers, members of the media and independent film crews, to register on site and get a sense of how best to approach fellow Burners to request their photo be taken, or be filmed. Great way to meet people, and you get a prime position to watch the world go by. Sign up for that right over here. This is the posse that cruises the dust, keeping an eye on Mutant Vehicles and ensuring that drivers keep things slow and safe. If you like riding around and helping humans not get hit by moving metal, this one’s for you. Rangers aren’t the police or security, but rather there to make sure everyone has a good time and doesn’t get hurt. 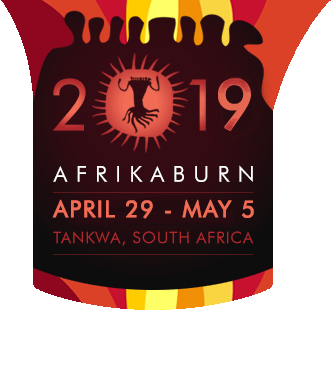 They’re active participants in the community, who promote awareness of what AfrikaBurn is all about and point out potential hazards. Rangers walk about, engage with the community and mediate where necessary. So if you enjoy assisting others, guiding the odd burner through a difficult circumstance and generally enjoy keeping the peace, you’re Ranger material. But bear in mind you must be calm, flexible and have a sense of humour. Sign up for shifts? Here. It’s the place where anyone can go if they’re having a hard time, or feeling overwhelmed. If it’s a physical or psychological challenge people are facing and it’s too much too handle, our Sanctuary crew will be on hand to assist in a calm, peaceful space. And you’re welcome to join the team. For info on Sanctuary (and a link to sign up, if you have the required skills), head here. Four shifts gets you a tee! Click here to join the fun. Ever wanted to spend some time at the nerve centre, and encourage people to sign up for shifts and help burners volunteer for what they want to do to make this event what it is? Do you enjoy sharing info? Then get hold of the volunteer team now! Click here for Artwork info. Click here for Theme Camp info. Get info on Mutant Vehicles here. PLEASE NOTE: Mutant Vehicles MUST be registered before the event – if you rock up with an unregistered Mutant, it will be grounded on site, and become a stationary artwork. Which will be no fun.